Providers of bespoke, real ice and top quality ice rinks all over the UK. We offer a complete turnkey solution to satisfy your brief. Let us know your requirements and we will get back to you as soon as possible. Welcome to Christmas Ice Rinks, providers of bespoke real ice, top quality ice rinks to public and private sector organisations across the UK for over 13 years. 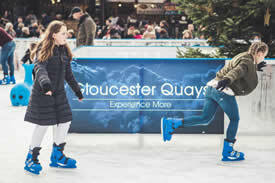 Read more about our 300m2 outdoor ice rink installation at Gloucester Quays, our work with Derby City Council since 2011, and our partnership with Warwick Castle. Real ice rink hire – why have one? Why do so many councils, landlords, visitor attractions, and businesses choose to install a temporary real ice rink? Read the top three reasons that our clients have shared with us on their thinking behind their decision in the last thirteen years. Ice rink hire prices – how much do they cost? Every real ice rink hire installation is different. We use our experience in doing everything we can to mitigate the costs so that the project fits into whatever budget you have allocated from it. From time to time, it may even be possible to install a real ice rink on a temporary basis for free for public sector clients. For private sector clients, work with us to draw up a business plan to make a return on your investment. Hire an ice rink – how does it work? The Christmas Ice Rinks team have been providing our public and private sector clients with world-class temporary real ice rinks which attract visitors and encourage spending in the wider community. If you’re considering a real ice rink for your prime location this Christmas or at any time of year, what do you need to know about how it works? Centrally managed by a talented, creative, and compliance-aware team led by an experienced managing director, we oversee real ice rink installation from planning to running to dismantling. Please contact the Christmas Ice Rinks team on 01789 298040 if you have any questions about our rink hire and installation services. We look forward to speaking with you.